The Evzones changing the Guard at the Tomb of the Unknown Soldier, Syntagma Square, Athens. The Evzones are the elite infantry and mountain units of the Greek Army. 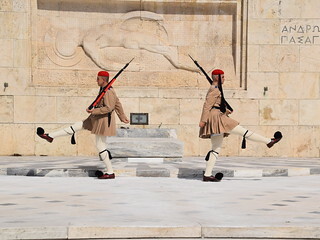 Today, it refers to the members of the Presidential Guard, a ceremonial unit that guards the Greek Tomb of the Unknown Soldier and the Presidential Mansion in Athens. Evzones are known for their distinctive uniform, which evolved from the clothes worn by the klephts who fought the Ottoman occupation of Greece. The most visible item of this uniform is the fustanella, a kilt-like garment.